Quake Kare ER™ Earthquake Preparedness Kits and Survival Supplies for the home, office, vehicle and classroom will help you prepare for and survive the aftermath of a devastating earthquake. No one can predict when or where an earthquake will occur thus it is imperative that you store an earthquake preparedness kit in your most frequented locations including your home, office, vehicle and/or classroom to ensure you have the proper supplies when and where you need them. Quake Kare ER™ Earthquake Preparedness Kits differ slightly depending on the location. 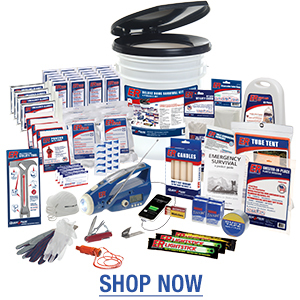 Earthquake kits for the home and office are designed for sheltering-in-place thus are packaged in a sturdy 5-gallon pail that can also be used for sanitation purposes. Earthquake Kits for the vehicle are packaged in backpacks and easy-to-carry cases for mobility. Earthquake survival kits for the school come in various sizes ranging from grab-in-go bags for individual students or classroom sized bucket kits for sheltering-in-place. ER™ Food and Water Rations have several strategic advantages over other survival food options. ER™ Food Bars are available in 2400 calorie and 3600 calorie options. Each bar contains enough calories and nutrients for one person to survive up to 72-hours. Three days of food in one compact bar creates a convenient and easy-to-store food source. The Food Bars and ER™ Water Pouches can withstand extreme temperature fluctuations allowing them to be stored safely both inside and outside. The high calorie food bars come packaged in a resealable pouch and are formulated without common allergens including nuts and coconuts. Water pouches can also be stored in the freezer for use as icepacks. Quake Kare Food Bars and Water Pouches are certified by the U.S. Coast Guard to remain fresh for up to 5-years. We highly recommend keeping a Car Earthquake Survival Kit in your vehicle at all times. Car survival kits are packaged in portable backpacks or carrying cases for easy mobility. They are designed to keep you sustained while on the go for up to 72-hours. ER™ earthquake kits for the car contain ER™ 2400 Calorie Emergency Food Bars and Water Pouches, emergency shelter, hygiene items, first aid supplies, solar powered lighting and hand-crank powered radios packaged in durable packs that can be carried on the back, waist or shoulder. ER֭™ Classroom Earthquake Survival Kits range from individual student kits to classroom size kits. Each kit includes ER™ 2400 Calorie Emergency Food Bars and Water Pouches. Pre-assembled classroom kits also contain thermal blankets, emergency lighting, first aid supplies, hand-crank radios and flashlights and items for hygienic emergency sanitation. Unlike homemade or classroom made earthquake kits, each ER™ classroom kit is guaranteed to store safely for 5 years even when stored outside. We specialize in developing customized kitting solutions based on your specific school’s needs. Call us at 800.277.3727 x104 and ask for John Caine to discuss your school’s needs. Quake Kare Office Earthquake Survival Kits range from individual employee kits to entire office support kits for 100 people or more. Depending on your specific company’s needs, we can customize kits and product offerings. For customized kits, give us a call at 800.277.3727 and ask for John Caine. Our pre-assembled kits contain ER™ 2400 Calorie Emergency Food Bars and Water Pouches, emergency shelter, hygiene items, first aid supplies, solar powered lighting, radios and water purification tablets packaged in either a bucket for sheltering-in-place or a pack for evacuations. And don't forget about your pets they will have needs too after an earthquake. They will be hungry, thirsty, and potentially in danger just like you. That is why we have developed Pet Earthquake Survival Kits which contain specially manufactured emergency pet food and water along with many other earthquake supplies which could save the your furry friends. We also recommend you supplement your earthquake survival kit with additional supplies you may need including a Power Failure Emergency Light, 5-Gallon Water Storage Drum and a 5-Day Personal Hygiene Kit.